Asked about collaborative efforts with World Jewish Relief, a British organization, Ms. Katz responded that WJR supports various activities related to children’s welfare, including the Mothers for a Better Future program. Mothers for a Better Future targets young single mothers, offering them childcare skills, vocational assistance (to make them more competitive in the marketplace), legal advice, and psychological services. WJR also supports programs for special needs groups and humanitarian aid for families in economic distress. 27. One of the groups that uses the Israel Culture Center premises for some of its meetings is Project Kesher, a local Jewish women’s group associated with the larger umbrella organization of the same name. The Dnipropetrovsk Project Kesher representation is one of more than 150 similar Jewish women’s groups throughout the post-Soviet states. 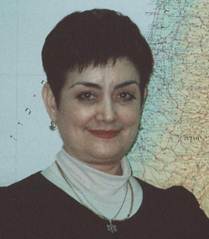 As is true in most Project Kesher groups, said Ella Sidorenko, a Project Kesher leader in Dnipropetrovsk, the local Project Kesher association is divided into several separate interest sub-groups. Ella Sidorenko, right, is a long-time activist in Jewish women’s activities in Dnipropetrovsk and is a leader in Project Kesher in that city. According to Ms. Sidorenko, the Dnipropetrovsk Project Kesher group includes a total of about 50 activists as well as additional women who participate in activities on an occasional basis. The largest cohort, perhaps 20 to 25 women, is the Beit Binah group, which focuses on Jewish education. Another group of about 15 women meets at the Special Needs Resource Center at Beit Chana; all of these women are mothers of children enrolled in the Center. Many are young single parents, said Ms. Sidorenko, and they are dependent on each other and Project Kesher for psychological support in raising their special needs children and addressing their own needs. The third Project Kesher group, continued Ms. Sidorenko, consists of 12 to 15 older female Hillel members. Project Kesher also enjoys a relationship with a women’s business club sponsored by the Israel Cultural Center; among other activities, this group has held seminars on Israel business opportunities and also studies time management issues related to managing careers and families. In addition to focusing on its own specific agenda, said Ms. Sidorenko, most Project Kesher groups also address various women’s health issues. In a society that remains squeamish about discussing certain health issues in public, many local women are ill-informed on matters concerning their own physical and mental well-being; fortunately, she continued, the larger Project Kesher organization has prepared excellent programs on this subject. Project Kesher also works in intergroup relations, encouraging tolerance among the different ethnicities in Dnipropetrovsk. On Holocaust Memorial Day, it brought together women of Latvian, Lithuanian, Belarusan, Georgian, Jewish, Russian, and Ukrainian backgrounds for roundtable discussions in the multipurpose room at the Israel Culture Center. In general, said Ms. Sidorenko, the entire local Project Kesher group convenes only on Jewish holidays. Many members, she said, will gather at the ICC for a Pesach seder that will focus on the role of Jewish women from the Exodus until now. Most sub-groups, such as Beit Binah or the group at the Special Needs Resource Center, meet monthly. Project Kesher encourages its members from different cities to meet and exchange ideas, said Ms. Sidorenko. For example, some local Project Kesher women met with Dniprodzerzhinsk counterparts during Chanukah, and another local cohort met with Project Kesher women from Krivoi Rog at Tu b’Shvat. Ms. Sidorenko and other Project Kesher leaders attend national seminars focusing on acquisition of leadership skills and on program concepts. 28. The sister-city relationship between the Boston and Dnipropetrovsk Jewish communities, various details of which are noted elsewhere in this section, was initiated in 1992 and today is the most comprehensive of any “kehilla” project connecting North American and post-Soviet Jewish population centers. It involves both Jewish and non-sectarian entities in each city, although most of the latter appear to have been promoted by Boston-area Jews. Almost all projects involve assistance from Boston to Dnipropetrovsk. The relationship also includes some projects involving Haifa, Boston’s Partnership 2000 city in Israel. Combined Jewish Philanthropies of Greater Boston (the Boston Jewish federation) provides essential subsidies to Beit Baruch, the Dnipropetrovsk Jewish day school, and certain other programs. Education components of the relationship include consultations in special education to the special needs program housed at Beit Chana and methodology for teaching English as a second language at School #144. Exchanges of teachers take place annually, and Boston-area Jewish teens travel to Dnipropetrovsk for a winter camp with local Jewish adolescents. Occasionally, the teen exchange also involves youngsters from Haifa as well. A medical care program provides critical expertise in geriatric care, as well as advice, training, and advanced technology in pediatrics and obstetrics/gynecology to Dnipropetrovsk clinics and hospitals. Boston Action for Post-Soviet Jewry, although an independent entity, initiated its Adopt-a-Bubbe program in association with the sister-city effort. Although some refer to the relationship as a “partnership,” almost all initiatives and funding originate in Boston. Unlike other relationships between North American Jewish federations and post-Soviet Jewish population centers, the Boston-Dnipropetrovsk relationship does not include collaborative projects with the Joint Distribution Committee, the Jewish Agency for Israel, or the Hillel student organization. Founded in 1653 at the confluence of the Udy, Lopan, and Kharkiv rivers, Kharkiv today is a city of 1.4 million people, the second largest municipality in Ukraine. Capital of Ukraine from 1921 to 1934, it remains a center of industry, culture, and higher edu-cation. Its industrial core is based on armaments and complex machinery, some of which has been sold in controversial arms deals to rogue states. Notwithstanding the relative sophistication of a portion of its economic base, however, the larger economy of Kharkiv and the surrounding area is floundering, a result of general Ukrainian economic conditions, poor governance and a failure of local officials to embrace private business initiatives. very visible throughout the city as they attend classes in universities and other institutions of higher education. Perhaps as many as 26,000 scientists are employed in Kharkiv’s universities and three national research institutes. The city is highly Russified, a product of its location near the Russian border and the key role of its industrial and educational institutions in the former Soviet Union. 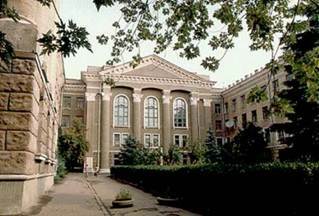 At left is the main building of the Kharkiv National University of Radioelectronics, one of many highly regarded institutions of higher education in the city. It currently enrolls about 12,000 students in 34 specialties. 29. The Jewish population of Kharkiv probably is between 15,000 and 30,000 according to the Israeli Law of Return, although the writer has heard both higher and lower estimates. Jews are prominent in almost every sphere of Kharkiv life, including government, business and industry, education, and culture; most openly identify as Jews and are friendly to Jewish organizations. However, as is the case in most post-Soviet large cities, only a small proportion of local Jews participate in any form of Jewish life. The writer, who was living and working in Cambridge at the time, was one of two individuals who initiated the project under the auspices of the Jewish Community Relations Council of Greater Boston. The other founder, Dr. Judith Wolf, remains active in the partnership; her family has provided leadership and resources for the special needs program at Beit Chana. One individual familiar with foreign student enrollment in Kharkiv said that a substantial number of Arabs and other foreign Moslems study at various post-secondary education institutions in the city. However, continued this source, Islamic and/or pro-Palestinian agitation is minimal because security forces are quick to deport any foreigners who espouse extremist views.